Green junior Rachael Cline drove in three runs in the Bobcats home SOC I win over Western. Green senior Kerston Sparks swings at a pitch during the Bobcats home SOC I win over Western. Green sophomore Ava Jenkins hit her first career home run Wednesday night in the Bobcats win over Western. 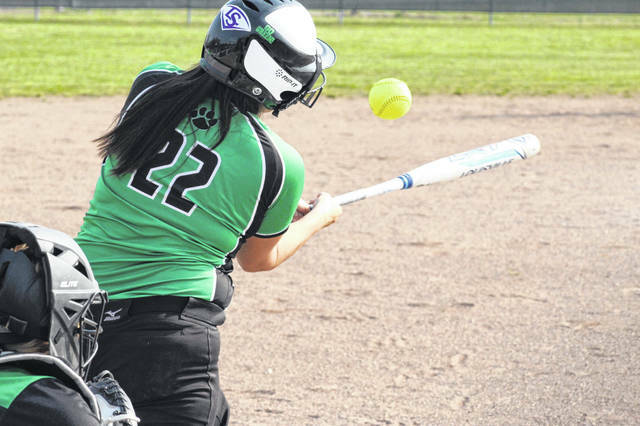 FRANKLIN FURNACE – An eight run first inning, a fourteen run third inning, and a total of 24 hits helped lead the Green Bobcats softball team to a 28-3 SOC I win over the Western Indians Wednesday night. 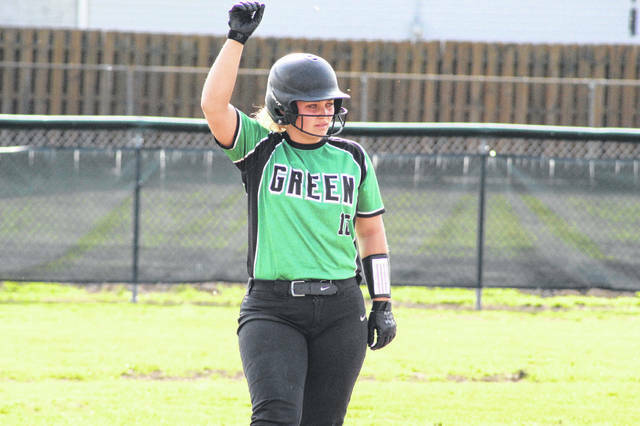 Those 28 runs scored by the Bobcats is a season high in 2019 for Scioto County’s twelve high schools. Have a day, Ava Jenkins. The sophomore daughter of the Bobcats head coach was spectacular Wednesday night both from the mound and from the plate. In her four innings of work on the mound, Jenkins allowed just four hits and no earned runs while striking out six Indians batters. However, from the plate, Jenkins was even more electric. The leadoff hitter finished 5/6 at the plate with a season high seven RBI, including her first career home run, a three run shot in the bottom of the first inning. Jenkins wasn’t the only Bobcat with a standout day at the plate, however. Kailyn Neal finished 3/5 at the plate with four RBI, Charli Blevins finished 2/4 with three RBI, Kasey Kimbler finished 3/4 with three RBI, Rachael Cline finished 2/3 with three RBI, and Kerston Sparks finished 3/3 with four RBI and four runs scored. 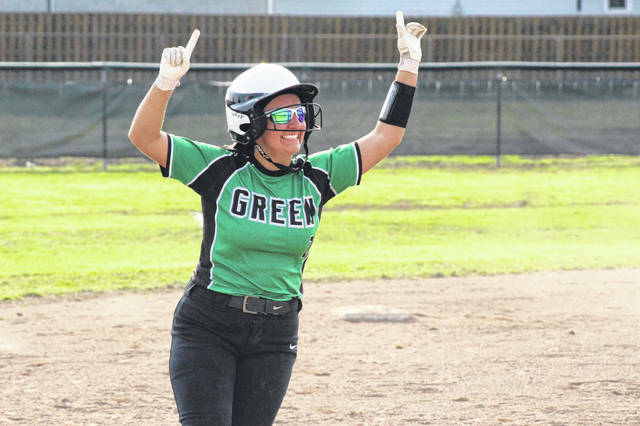 With Wednesday’s win, Green improves to 7-7 overall with a 5-2 record in SOC I play, two feats that haven’t always been constants with the Green softball program. Yet, today they are and likely will continue to be for the foreseeable future with a young and talented lineup. Both Jenkins’ know that they’ll need to keep working to contend with teams like Clay, Notre Dame, Symmes Valley, the proverbial SOC I powerhouses. But both feel as if their program is knocking on the door of accomplishing some great feats.